Micheál Donoghue believes it’s a groin issue that forced Canning off in the Waterford loss. 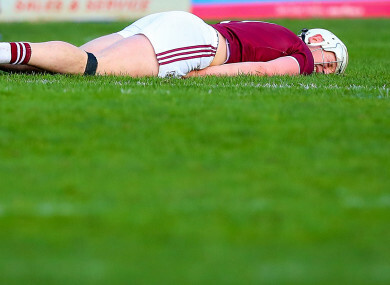 Joe Canning on the deck after a heavy hit from Kevin Moran. GALWAY’S MISERY AT their Division 1 semi-final defeat to Waterford yesterday was compounded by the injury which saw Joe Canning stretchered off late on in Nowlan Park. Canning was sized up and nailed with a shoulder from Kevin Moran in the 70th minute as he bore down on the Waterford goal. Tribe boss Micheál Donoghue indicated after the game it was a leg injury that Canning sustained, with his groin the area of concern. “He’s still getting assessed there so we won’t know for a while,” he said. “He’s literally still being assessed by our medical team so until they determine what it is, we’ll be acting upon it tonight or tomorrow I’m sure. “I think it was his groin. He took a few heavy hits on it and I’d be intrigued to watch it back and see the hits he got going into it, just before it. “There would be one in particular I’d be interested to see back,” he added. Galway looked on the verge of setting up a league decider against their All-Ireland final conquerors when Mikey Kearney was sent-off for Waterford in the 51st minute, but the Déise controlled the game until the finish. The reigning Leinster champions scored just seven points in the second-half and Donoghue was at a loss to explain their display after the break. “First and foremost, disappointment. In the first half I thought we worked really hard. Our decision making was good. In the second half, particularly going down to 14 men, I thought some of our decision making was poor. “We had seven in a row wides and ultimately, that probably cost us in the end. “Overall, I’m not going to fault them with their work and their attitude. Our agenda at the start of the league was see if we could find a few players so we are happy enough now going away now in terms of our championship preparation. “Our intention was to obviously come and try and win the game. “I was really happy with our application in the first half and as I said, I felt our decision making didn’t help. “But ultimately we came here to try and win and get to a league final. At the end of the day it was a national final and of course we wanted to get into it. Email “Galway concern at Canning injury after star forward stretchered off in Déise defeat”. Feedback on “Galway concern at Canning injury after star forward stretchered off in Déise defeat”.